You no longer need to be a C-level executive to have your own personal assistant. Thanks to Siri and Google Now, we've embraced the idea of the smartphone as an aide, and there's a virtual secretarial pool of apps that can do everything from schedule meetings and pay bills to give you the day's box scores. Here are five apps that put the "do" in your to-do lists. Often the challenge is not executing your to-do list, it's creating the list in the first place. 24me solves that problem by automating the process. With help from the Check.me service, 24me integrates with hundreds of U.S. banks and thousands of utility and service providers such as Comcast and AT&T. By accessing your accounts, it will determine when your bills are due and populate your calendar with reminders. Similarly, 24me can link with your social networks to remind you of friends' birthdays or anniversaries, suggest gifts, and even direct you to an online store for purchase. 24me works with Apple maps, Google maps or Waze to provide navigation assistance. Include an address in a calendar event and it will give you a street view of the location, travel time to the destination and step-by-step navigation. Need a physical task done? 24me includes TaskRabbit integration. If you happen to live in one of the 17 cities where the outsourcing service operates, the app will identify your need to, say, "mow the lawn" and help connect you with the service. 24me integrates with Google Calendar, Outlook exchange, Yahoo calendar, and Outlook tasks. It also syncs with the native iOS Reminders app. An Android app is planned, although the company hasn't announced when it will be released. The problem with to-do lists is that you have to remember to look at them and keep them updated. Shifu uses your location and phone usage patterns to proactively push reminders to your screen at the right moments. You can set reminders based upon your Wi-Fi connection, location, who you're talking with or how much time you have. For example, you can have Shifu remind you to download apps, movies, or music the next time you connect to your Wi-Fi network, or to pick up printer toner the next time it sees you're at Best Buy. You can also tell Shifu to remind you about subjects to bring up the next time you talk with designated contacts. 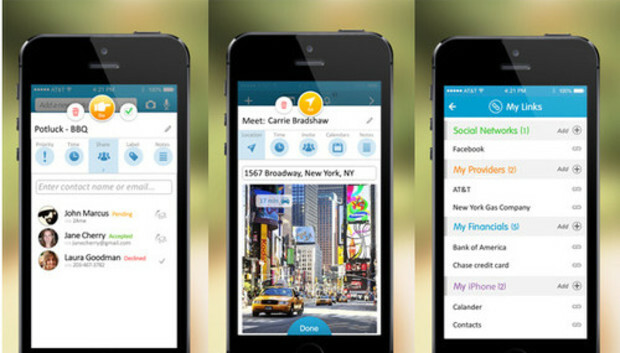 When Shifu sees you're making or receiving a call from the person, the app will flash a reminder on your call screen. Once you hang up, Shifu will ask you if you want to get another reminder about the topic later in case you didn't broach the subject, or check it off as completed. Shifu will also remind you to call people back if you miss their calls. You can also tell Shifu to remind you to do things whenever you have free time. It will determine when you're commuting, for example, based on the cell towers your phone registers with and nudge you to call your mother or write that email you've been putting off. Assistant stands out if you prefer using voice commands and responses. The app can brief you at the same time every day on upcoming calendar events, current news headlines, and even the weather. Tell Assistant you want Mexican food or pizza, and it will summon Yelp listings according to your location. It'll even read the names of the restaurants, tell you the star ratings, and let you know the distance from your location. Just tap a mute button when you've heard enough. You can customize the Assistant avatar's gender, looks, and and clothing. For $1 you can upgrade the synthesized voice to a real one, and for $3 a month or a $20 one-time upgrade you get an ad-free interface, the ability to turn on the app by saying "Hey Assistant," and lock others out of the app with a PIN. "Ask and ye shall receive" pretty well describes Sherpa. You can tell Sherpa to send someone a text message or post to Facebook or Twitter. Ask it to update you on current events, and it pushes you to Google News. Enquire how a particular NFL team is doing and it will audibly share the final scores from the most recent game. You can have Sherpa notify you when your favorite teams score and when social media activities arise, such as Facebook friends' birthdays and mentions on Twitter. It will also tell you when the weather is getting worse and let you know when you miss a call. There are a few kinks, though. Once I told it I wanted pizza delivered, and it bumped me over to Google Maps and showed me the closest supermarkets. Sherpa will send you to YouTube for any query that begins with "how do I," which might not be what everyone wants. Generally, however, it understands a user's speech quite well. Mynd is a context-aware calendar iOS app with a beautiful user interface. Using location awareness, it can automatically associate places with tasks or events. For example, if it detects your phone is always at the gym when your calendar says "spin class," Mynd will add your gym location to all your spin-class dates. How is this helpful? Transit time, for one thing. If it's 4:30 p.m. and your spin class is at 5:30, but Mynd knows heavy traffic will extend your drive time to 35 minutes, it will calculate how much earlier you have to leave and adjust its alerts accordingly. Other nice features include LinkedIn and Evernote integrations that let you gather information about people you're meeting with and attach Notes to meetings, respectively. I especially liked the tile-like home screen that communicates several things at a glance, such as weather, Apple reminders, and how many miles you've traveled in the day. Manchester United vs. Chelsea: Who will win at sports tech?